First off.. I gotta give out some cover love! I mean.. wow. I love it. It shows off so much of the story, the steampunky feel, the romance and a bit of the darkness that's lurking as well. Just. Perfect. I thought maybe I was getting my hopes up when I started this book. I fell so hard for the cover, and the description really pulled me in. 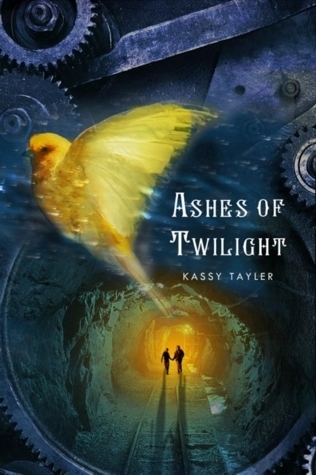 Thankfully, Kassy Tayler did not disappoint, Ashes of Twilight won my approval. The Steampunk / Post apocalyptic feel to this story was perfect. The author has a way of describing things that made me feel like... I was breathing in the ashes, I could feel the dirt caked underneath my nails. It sucked me in so completely. Beautiful scenes that made me wish it could all be real such as underwater pools filled with glowing fish. I want a glow in the dark fish now... not even kidding. This story if full of heart stopping moments. The action, as well as the heartache... Kassy created characters that I connected with, and felt their emotions with them. She also created ones that.. I hated. I mean HATED. But in the end.. Wren was a character who was able to forgive some of those people who had wronged her. It made me .. proud? of her character. Ashes of Twilight does have a very "City of Ember" like feel to it.. - I haven't actually read that book >.<.. But I have watched and loved the movie * prepares for ragey comments * However I feel like Ashes of Twilight stepped it up. It made it something that both teen and adult readers can enjoy. There were very few things about Ashes of Twilight that I did not enjoy. There is a bit of "insta-love" which.. at times can be maddening. However it did not feel overdone, I feel like the relationship continued to grow throughout the story and it wasn't completely instantaneous. There were also a few parts that made me uncomfortable. Wren being put in positions that just made me want to be like " GET OUT OF THERE YOU IDIOT" But again, the strength of her character eventually overcame and I think while some may think of her as being stupid for forgiving some of her " friends " and their actions. I personally liked how she handled it. Kassy Tayler created a story that shows off a strong Female MC, a character that does not accept her " place " in her world and dreams of something more. She created a story that made me want to crawl inside the pages, and Join the Revolution! Great review! I haven't heard of this before but I am going to add it to my TBR list. I love novels that make you feel like you are there along with the character and I can stand some insta-love if the writing is well done!